NOTE: Knife is not included. Medium Custom leather knife sheath without belt loop. Features a hand tooled half basket weave design in Black, Chocolate Brown, Saddle Tan, Mahogany, or Natural leather with natural edging or Natural leather with black edging. A color chart can be found by scrolling through the photo's. Please contact me for color samples if desired. Fits most knives measuring up to : 3 1/2" to 4 " Long X 1 1/8" W X 1/2" thick OR 1" W X 5/8" Thick. 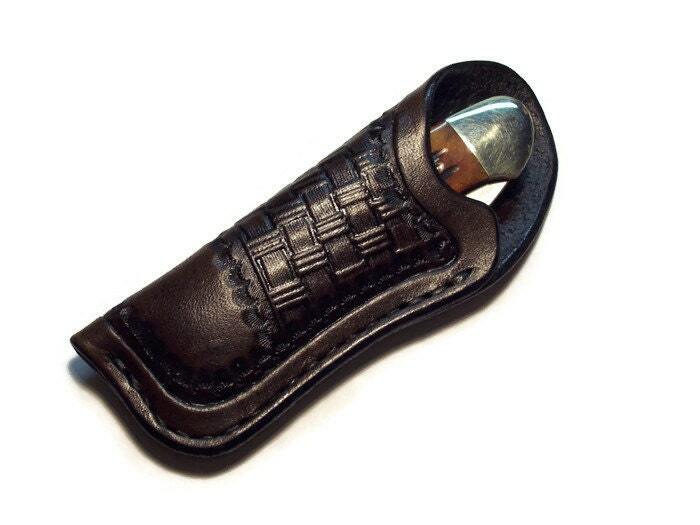 Sheath is custom designed and hand tooled on premium carving leather, has hand rubbed finished edges, and recessed hand stitching. Stitching is guaranteed for the life of the item. This item is made as ordered and takes 7-14 business days to ship if not in stock. It Works well with Buck 389, Case Sea Horse Whittler, Case Sod Buster Jr., Medium Trappers, Case Canoe, GEC Outlaw Jack, Uncle Henry LB5, Swiss Army Tinker, Spartan, Pioneer and many like knives. Quality made in the USA!